In the culinary arts, the word duchesse (pronounced "DOO-shess") refers to a French recipe for puréed potatoes that includes butter, egg yolks, and seasonings. The classic duchesse potatoes recipe is seasoned with a small amount of nutmeg in addition to salt and pepper. Also known as pommes duchesse, duchesse potatoes are piped through a pastry bag into various shapes, including little stars or spiral mounds. The purée can also be piped into straight cylinders for making croquettes. Once piped onto a baking sheet, the potatoes can be brushed with egg wash and baked until slightly browned. 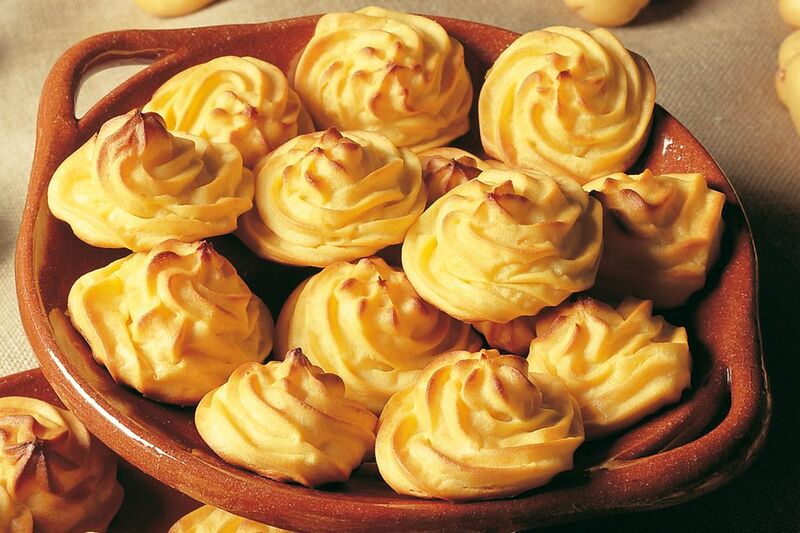 Duchesse potatoes are sometimes piped around the edge of a platter as decoration. The key to duchesse potaotes is ensuring that the purée is very smooth with no lumps, and also slightly stiffer than for ordinary mashed potatoes. Traditionally, duchesse potatoes are made by passing the cooked potatoes through a food mill or a potato ricer.